Marlie and Me: Fluff the Bum Cloth Diapering Event in April! 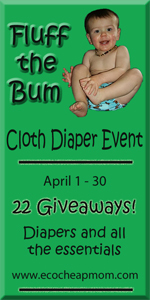 Fluff the Bum Cloth Diapering Event in April! I am so excited to share the news that Eco-Cheap Mom is hosting a month-long series of giveaways in April for cloth diapers and accessories. She has lined up some awesome sponsors, including rumparooz and FuzziBunz! Mark your calendars so you won't miss your chance to win some great prizes for your fluffy stash. I know I can't want to start entering! What a fun giveaway! I don't have a little one in diapers right now, but in the future when I do I think I am going to try cloth.